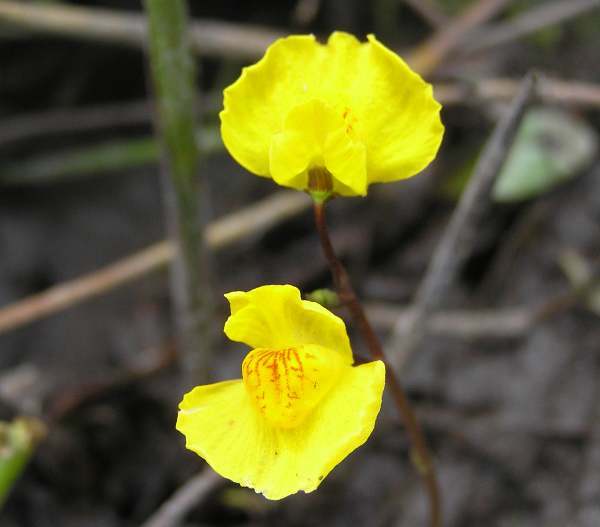 Below: Bladderwort, an unusal carniverous bog plant, occurs at Rhos Goch. Wet is the word that comes to mind when describing this nature reserve, close to the Wales-England border. Although it has many interesting features and species this is certainly no place for a casual stroll, and for most of us it may be one of the nature reserves that is best left to specialists. If you do decide to visit, it should be between June and September when the land has dried out to some extent. As there are no formal paths through the reserve you should be prepared to turn back if the going gets too boggy and dangerous to continue, and you should either be accompanied or let somebody know where you are going and when you plan to return. The habitats that make this nature reserve so special are active raised bog, transition mire and quaking bog, all of which are becoming increasingly rare in Wales (and indeed elsewhere in Britain and Europe) due mainly to land drainage work carried out for agricultural purposes. Each of these special habitats supports unique species of plants and insects. 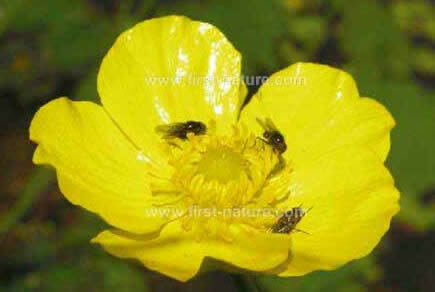 Rhos Goch National Nature Reserve is managed by Natural Resources Wales (NRW). From Builth Wells take the A470 main road towards Brecon, and then turn left, crossing the River Wye via the B4594 signed towards Painscastle. Take the right fork towards Painscastle - the left fork goes to Aberedw - and continue on the B4594 for 10km through Painscastle and then a further 3km to Rhos Goch hamlet. At Rhos Goch look out for a concealed right-hand turn towards the Rhos Goch Holiday Park. If you come to the sign for the Golf Club you have gone about 25m too far. Once at the Rhos Goch Holiday Park there is a track running down on the left hand-side of the entrance; this track leads to the reserve and goes beside a private house. The entrance to the reserve is approximately 200 metres down the track. Do not take your car down this track, as there is nowhere to park at the reserve and you will quickly become bogged down in the wetland which begins quite some way before the reserve entrance! Below: The turn to Rhos Goch Holiday Park is difficult to spot! 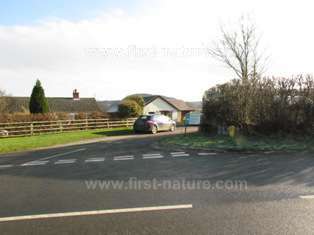 This reserve is best left to the widllife, but if you really want to go there and are travelling by car, park on the main road in the village of Rhos Goch and walk from there. You will need wellingtons in good conditions even in the months of June to September, and more likely thigh waders (at least) at other times of the year! This NNR is open all year round but dangerous in winter. There are no paths in the reserve and the wet ground can make access to and within the site very difficult indeed. The nearest pubs, shops, cafés and public toilets are in Hay on Wye, which is about 8km from the reserve. Rhos Goch has a sequence of wetland habitats leading down through the reserve from the raised bog that lies at the north eastern end. Until recently the raised bog was badly affected by the encroachment of scrub, but this is now intensively managed both by cutting and also by a regime of grazing by cattle. Other research also points to the damage of peat deposits, particularly around the edge of the raised bog, and this is almost certainly due to the site having been exploited by digging of peat in the past. There is also evidence of dramatic fire damage having occurred in the interesting history of this nature reserve. Although for most of the year, at least, the habitats at Rhos Goch may not be very friendly to human visitors, they are extremely good for some visiting and resident birds and for other wildlife. In addition there are a number of interesting and unusal plants at various parts of the reserve; these include bog mosses found in water-filled hollows that occur across the surface of the mire. Both Sphagnum cuspidatum and Sphagnum recurvum occur in these areas along with some of the most beautiful of the wetland wildlflowers - Bogbean (Menyanthes trifoliata), Marsh Cinquefoil (Comosum palustre), Marsh Marigold (Caltha palustris), Greater Spearwort (Ranunculus lingua), Lesser Spearwort (Ranunculus flammula), Bladderwort (Utricularia australis), and even the magnificent Royal Fern (Osmunda regalis). Pillwort (Pilularia globulifera), an unusual kind of fern, is also found in the wet and muddy parts of the reserve. Its leaves are bright green and hair-like, but its common name derives from a hard pill-like swelling which is found on the rhizome of the plant. For wild orchid lovers both Heath Spotted-orchid (Dactylorhiza maculata) and marsh orchids bloom at Rhos Goch towards the end of May and throughout June. The drier areas of the reserve are dominated by Heather (Calluna vulgaris), Cross-leaved Heath (Erica tetralix) and Purple Moor-grass (Molinia caerula). Both the remnant alluvial forest and bog woodland that encircle the bog at Rhos Goch are also important features which contribute to the reserve having been designated as an SAC. If you exclude the Elan Valley Estate and Claerwen National Nature Reserve, which abound with Buzzards (Buteo buteo) and Red Kites (Milvus milvus), this part of Wales is not particularly good for birdwatching. Rhos Goch does get a few callers-in along with its populations of resident birds, however. Snipe (Gallinago gallinago), Lapwing (Vanellus vanellus), Reed Bunting (Emberiza schoeniclus), Sedge Warbler (Acrocephalus schoenobaenus), Grasshopper Warbler (Locustella naevia) and Curlew (Numenius arquata) have all been recorded here in recent times. In the summer Water Rail (Rallus aquaticus) is rumoured to be heard but not seen! The managed grazing at Rhos Goch creates bare muddy patches that are particularly good for invertebrates, and some rare species of beetles, and spiders are present. The scarce Blue-tailed Damselfly (Ischnura pumilio) lives in the wetter parts of the reserve. Wales is exceptionally lucky in having a number of bog, fen and mire nature reserves. If you are really interested to go and see them and learn more about the wonderful wildlife of such places but are worried about the safety concerns of visiting Rhos Goch particularly with young children in tow, there are others that are better suited for visitors. In North Wales there is Fenns, Whixall and Bettisfield Mosses NNR, and the Anglesey Fens NNRs, while in Southwest Wales Tregaron Bog (Cors Caron) NNR and Borth Bog (Cors Fochno) at Dyfi NNR are all outstanding examples of this type of habitat. These NNRs, with their excellent facilities, are ideal for the whole family to visit and enjoy.